A typical American household with four wireless phones paying $100 per month for taxable wireless service can expect to pay about $229 per year in wireless taxes, fees, and surcharges—up from $221 in 2017. Nationally, these impositions make up about 19.1 percent of the average customer’s bill—the highest rate ever. 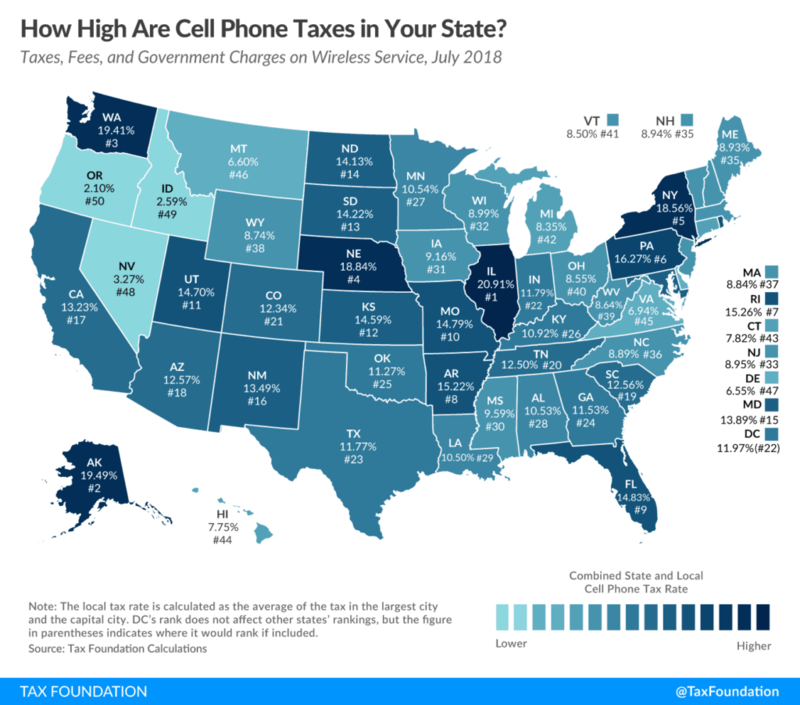 Illinois now has the highest wireless taxes in the country at 27.6%, followed by Alaska at 26.1%, Washington at 26.1%, Nebraska at 25.5%, and New York at 25.2%. Since 2008, average monthly wireless service bills per subscriber have dropped from just under $50 per-line per month to $38.66 per month—a 23 percent reduction. However, wireless taxes have increased from 15.1 percent to 19.1 percent of the average bill—a 27 percent increase. Most states impose higher taxes, fees, and surcharges on wireless service than on other taxable goods and services. In Alaska, which has no state sales tax but allows local sales taxes, wireless taxes are nearly eight times higher than local sales taxes. Other states with significantly higher wireless taxes include Nebraska (2.6 times higher), Pennsylvania (2.3 times higher), Maryland (2.3 times higher) and Illinois (2.2 times higher). At the end of 2017, over 68 percent of poor adults had only wireless for their phone service, and 53 percent of all adults were wireless only. Excessive taxes and fees, especially the very high per line charges like those imposed in Chicago and Baltimore, impose a disproportionate burden on low-income consumers. In Chicago, taxes on a family with four lines of taxable wireless service paying $100 per month are nearly $500 per year—over 40 percent of the bill. Leonine Public Affairs works with the major wireless carriers to shine a light on the excessive taxation of wireless consumers, with the goal of bringing wireless taxes in line with sales taxes applied to other taxable goods and services.